After a winter of short days and gales, spring sees releases restart on the north coast of Jersey. April 2014 and this time there were eight choughs in the release group, all bred at Paradise Park, Cornwall. Time had been taken earlier in the year to repair the aviary, train the birds and attach radio transmitter to four birds (three being new recruits and one which had lost hers). This time they were much quicker to leave the aviary than in the previous year – five flew way up into the sky before returning down to the coast. Soon the birds developed a daily pattern of flying and foraging, with some again hanging about in Ronez Quarry but all returning to the aviary for supplementary food. Choughs spend much of their day probing for food and as the released birds were still young, no nesting activity was expected. However, young choughs will take the opportunity to search out potential sites for future nests and start selecting their mates. Meanwhile the captive birds at Paradise Park, and also at the Durrell Wildlife Park, were set up in their breeding aviaries. Paradise Park had five pairs of birds and eight parent-reared chicks were produced. At Durrell four hand-reared chicks were raised from two pairs, and these young birds were released in August. It is useful to have a mix of parent-reared and hand-reared birds in a soft release. In early September six more young choughs were transported to Jersey from Paradise Park, this time arriving is some style! The birds were collected at Perranporth Airfield by Lee Durrell and Colin Stevenson, both being qualified pilots and happy to give their time to the project. 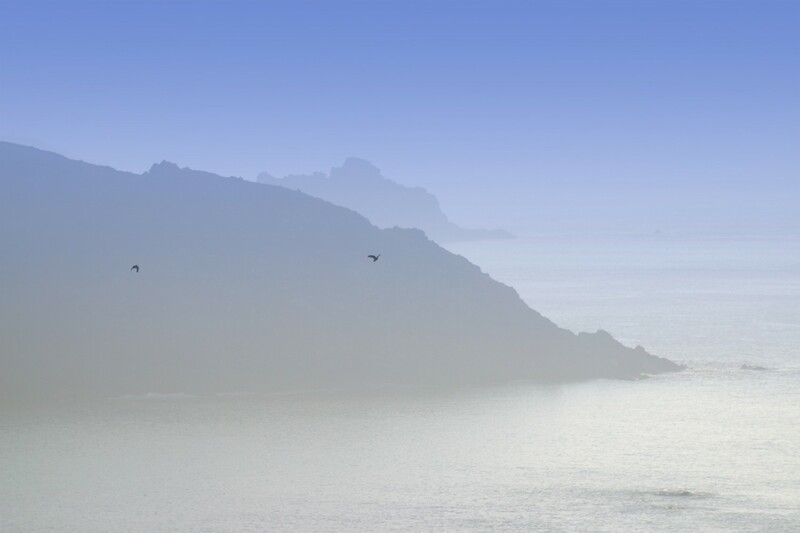 With their help the travel time from Cornwall to the coast of Jersey was reduced to little more than three hours, with obvious benefits to the birds. 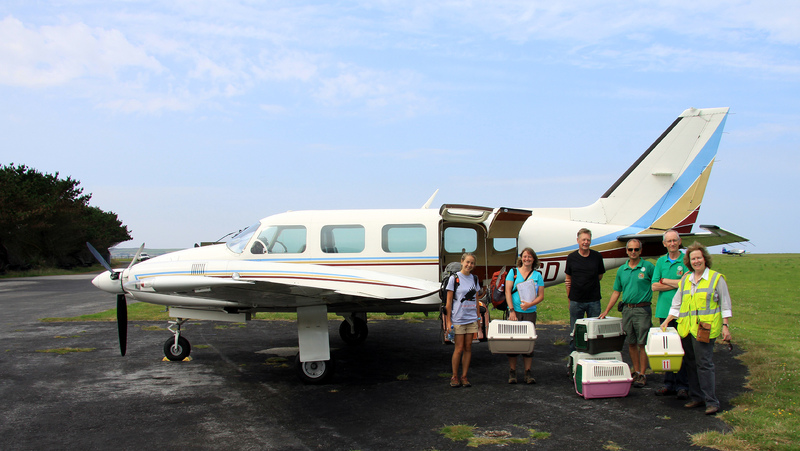 After a period of quarantine, all the young birds were flocked together, and then after some whistle and target training, were released to join the flock around the coast at Sorel Point. 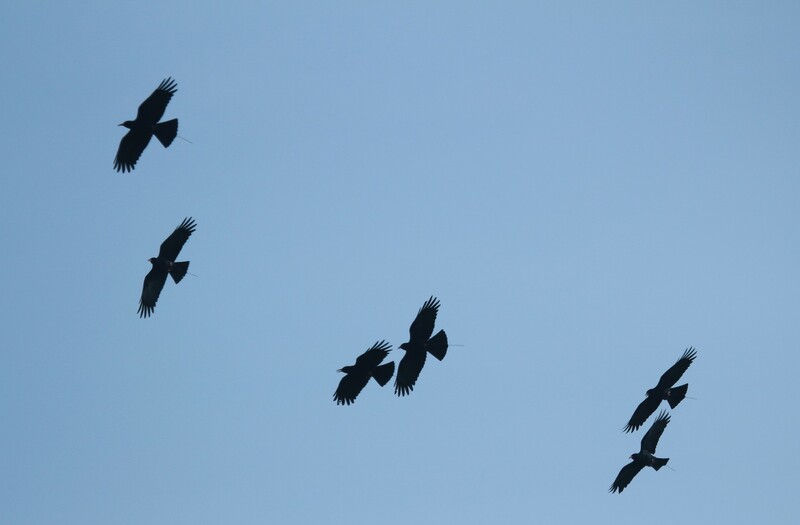 It was just so good to see sixteen choughs flying together! Every day they were learning from each other, improving their flying skills and predator awareness. In late October the ten younger birds seemed to make a decision to explore the island together, and went as a flock to the south coast – an area which was known to be the site where choughs bred in past times. They stayed for a few hours then returned north to the aviary, and followed this pattern for several days before reverting to their sedentary ways for the rest of the winter.